I bought a set of cork tape, seven dollars from my local neighborhood outdoor shop. A good deal considering the price goes over 10 dollars. With Spring around the corner (this upcoming Saturday), I felt the time was right for a Spring clean up. 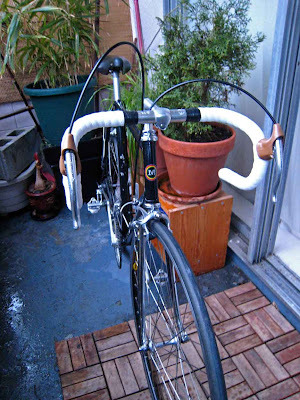 Amael Moinard wins the final stage 7, P-N.
Come to think of it I've use black cork tape for over four years. I started off with white cello tape, my favorite by Benoto. I believe it's not made anymore. A pity. I loved that shiny cello tape. It was the classic tape used in the 80s. 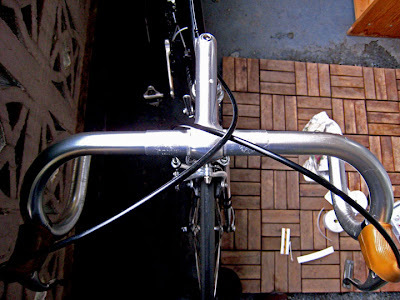 I stripped off the old tape, peeling it away right down to my smooth and glistening aluminum Cinelli handlebar. 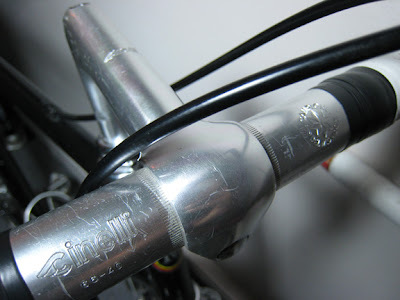 More percisely, I have the model 66-40 Campione Del Mondo road bar. The '40' means 40cm center to center. I marveled at it. A beauty to behold. I placed the new tape on and wrapped it with joyful pride. A new season was about to start. Spring brought out the best at this year's race to the Sun, Paris-Nice. Many riders' finding their form in a difficult week long test. Alberto Contador showed his form along with compatriots; Alejandro Valverde & Luis Leon Sanchez. 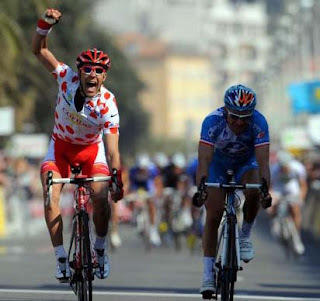 But, I thought of the final stage winner going, symbolically, to a Frenchman. Amael Moinard took the stage convincingly and scored enough points to win the Polka dots mountain jersey. One thing's for sure, the ever hopeful French cycling fans are feeling that his success can 'spring' a new beginning at this year's Tour de France! My classic Cinelli 66-40 Campione Del Mondo & stem. Thank you it's been with me since 1987! On the race to the Sun, the Spanish are in good form for the European Spring. Thanks, the white tape is classic. The Spanish armada will do more damage this season!